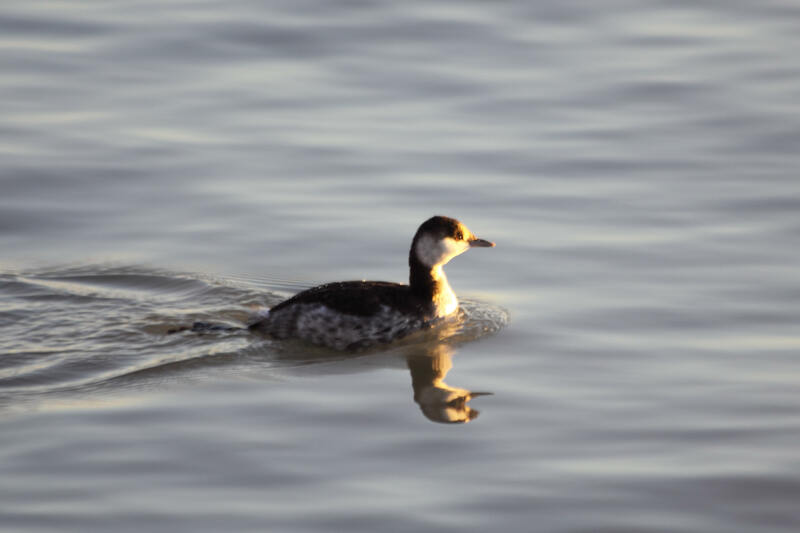 Every spring I watch and wait for Horned Grebes to return to the lakefront. This afternoon, on an otherwise blustery, windblown day, the sun shown long enough to wake up a Horned Grebe taking a nap in Monroe Harbor. He woke up and started swimming toward me. And allowed me to watch him scan the water for places to dive. Until he disappeared for the last time. This morning was beautifully sunny and clear, although a brisk north wind kept things rather chilly most of the morning. I started out kind of late, around 9:00 a.m., and went to the Chicago Portage to see if anything had changed. There were more Tree Swallows than a couple weeks ago, perhaps a dozen or so. But there were no new birds. I had hoped to see at least a Yellow-Rumped Warbler, and maybe a few different sparrows. Maybe the wind was blowing from the wrong direction to bring in new migrants. I managed to get a few nice photos of the current residents anyway. A couple Canada Geese got into a disagreement which caused the water to fly. A Northern Cardinal was singing to the right of the path. I heard Song Sparrows singing and finally found one. And of course there were a lot of robins. Around midday it was much warmer but the wind picked up. I went to McGinnis Slough to see some different birds. 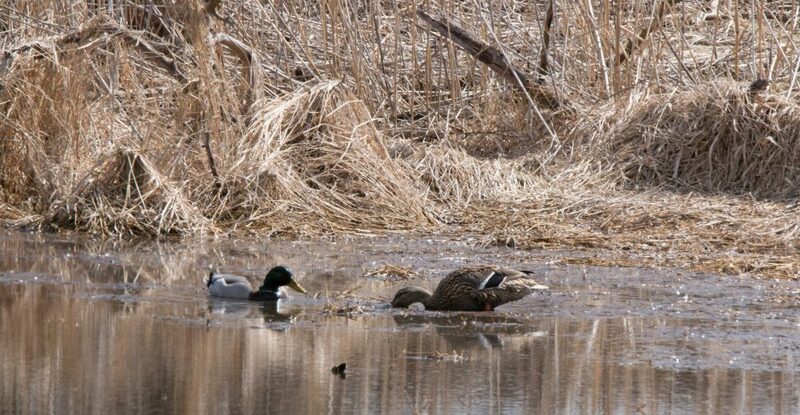 There were several species shared between the two locations such as Red-Winged Blackbirds, Black-Capped Chickadees, American Robins, Tree Swallows, House Finches and Mallards. Generally McGinnis has more water birds, although for the most part they are hard to photograph because they are usually too far away. On the other hand, this Red-Winged Blackbird was more cooperative than the ones at the Portage. I got lucky with this Great Blue Heron, one of seven I saw fishing in various shallows. There were perhaps 250-275 American Coots. This one was swimming around with something wrapped around its body. Looks like a water plant pulled up from a dive. There were 20 or more Pied-Billed Grebes but they were too far away to photograph. As it is this Horned Grebe eating a fish it had caught is barely recognizable. 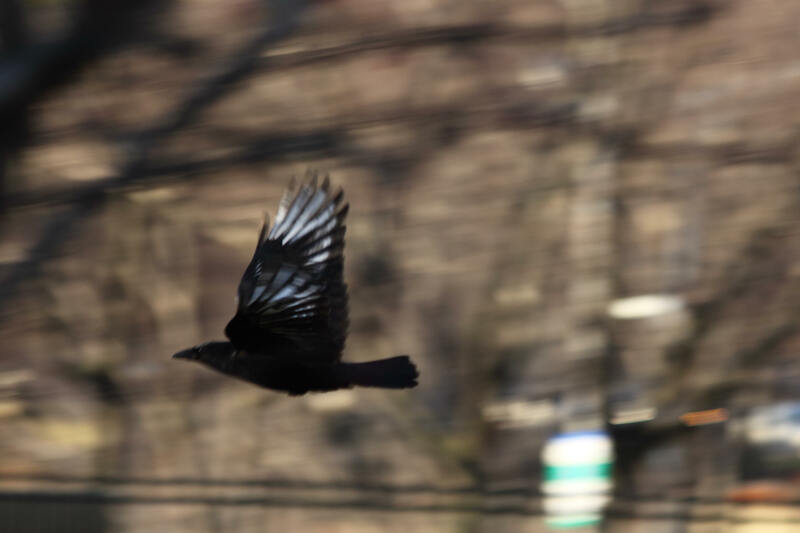 This might be the year I figure out digiscoping. Or not. There will always be birds too far away. except maybe in the lake. It was full of Horned Grebes in their spring finery. Here’s one living up to his name. These pictures were taken on March 28, 2011.
or leafing out. The grass is green, and we have had no rain. Very few divers remain in the lake, mostly gulls among the buoys. Are the buoys out earlier this year? A Ring-Billed Gull this morning, coming in for a landing. but much of spring migration has not yet caught up with the weather and the flora. We have another month or more to go before we see the warblers. I went down to the lakefront this morning because after days of stormy clouds and 60 mph winds this was the only day of predicted sunshine. Sunshine was in abundance, at first glistening off the water by the yacht club with no birds in sight. But that changed within a minute or two of my arrival. 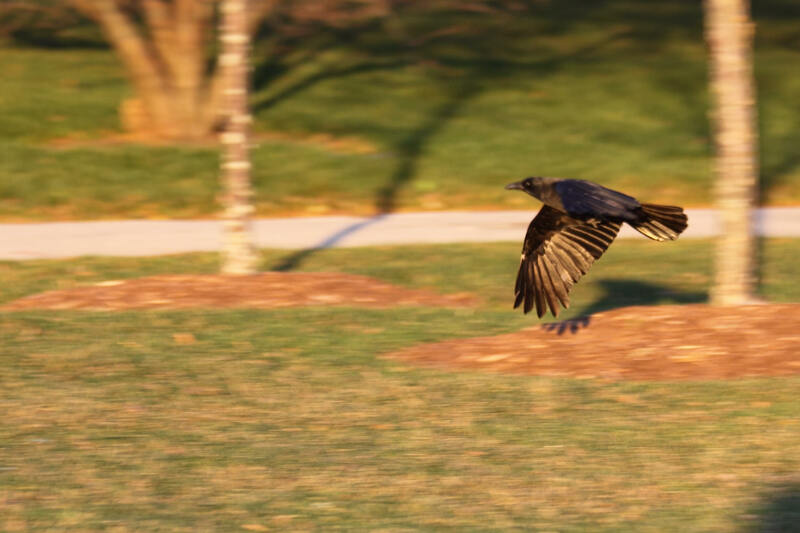 Of course the Crow Crowd was following me. Carrying my camera in one hand and the bag of goodies hanging off the other arm isn’t ideal but I thought it might be a good day for flight pictures. 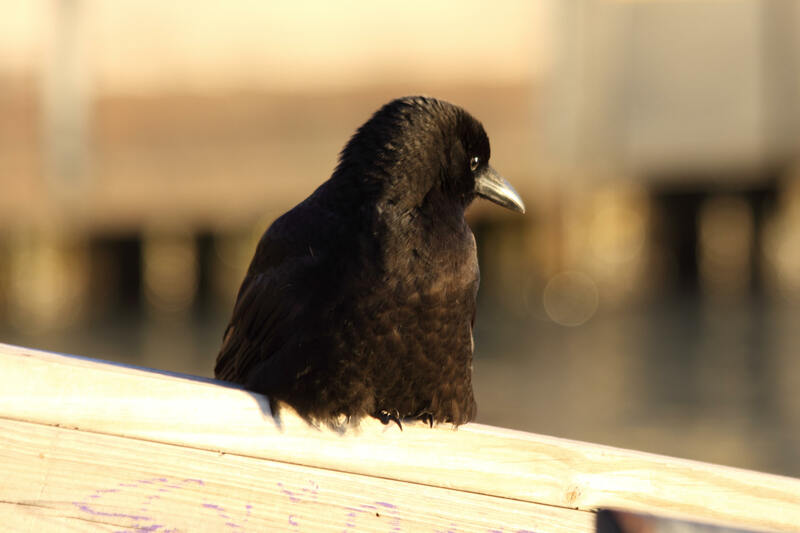 I’m calling this crow Fuzzy because his head feathers are so brush-like. 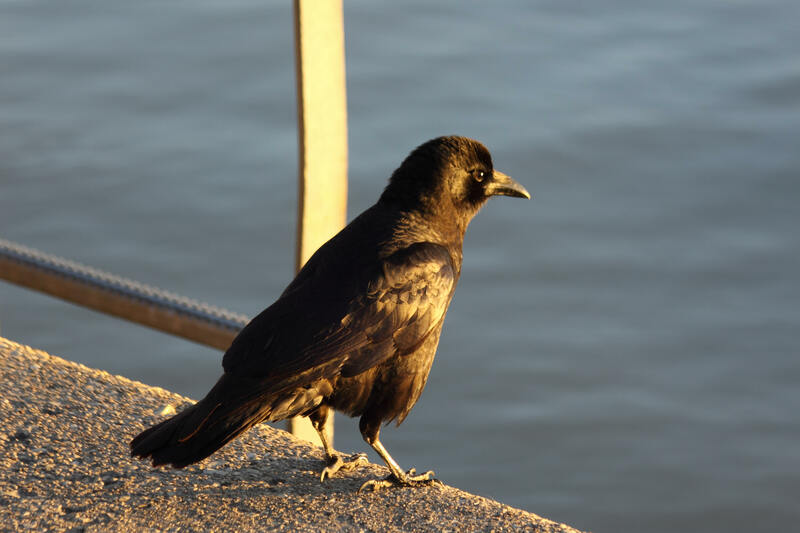 Maybe this is a bad hair day for a crow but I think he’s pretty cute. 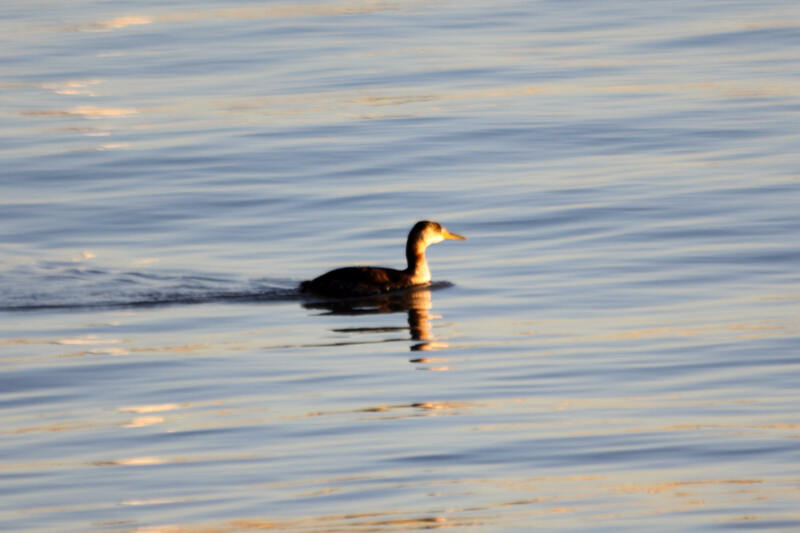 A friendly Horned Grebe surfaced close to the sidewalk shore. Farther out I spotted the Red-Necked Grebe, a less-frequent visitor. 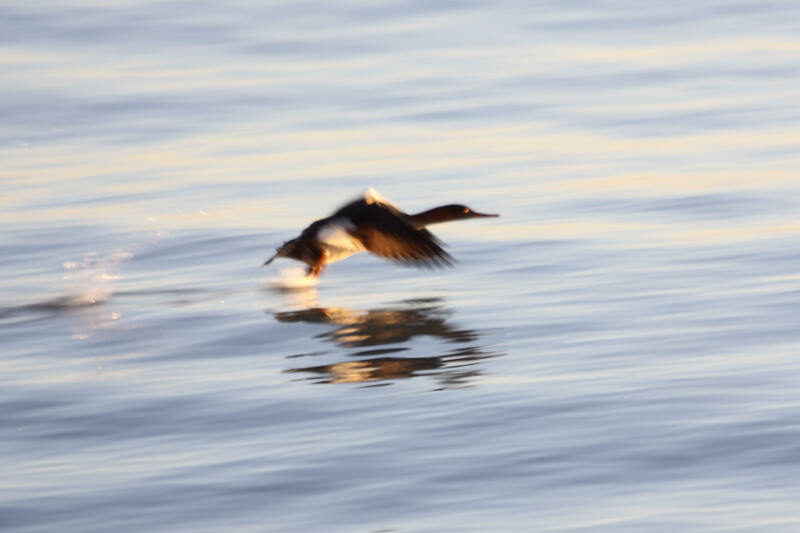 And a Red-Breasted Merganser took off to catch up with her buddies. 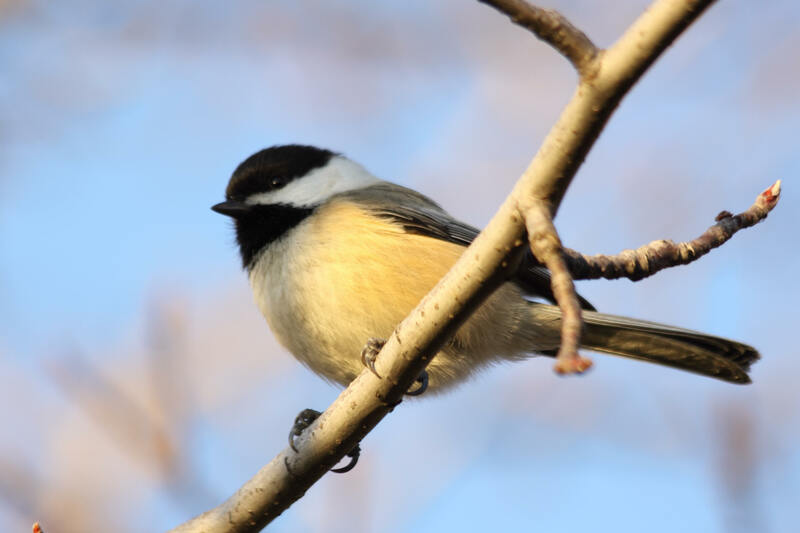 Eventually a Black-Capped Chickadee will come for peanuts too. I sometimes shell the peanuts for them if they’re fast and sneaky enough to make off with the goods before the larger birds come back. But I caught this Chickadee shelling his own peanut a few days ago. It was almost as big as he is. 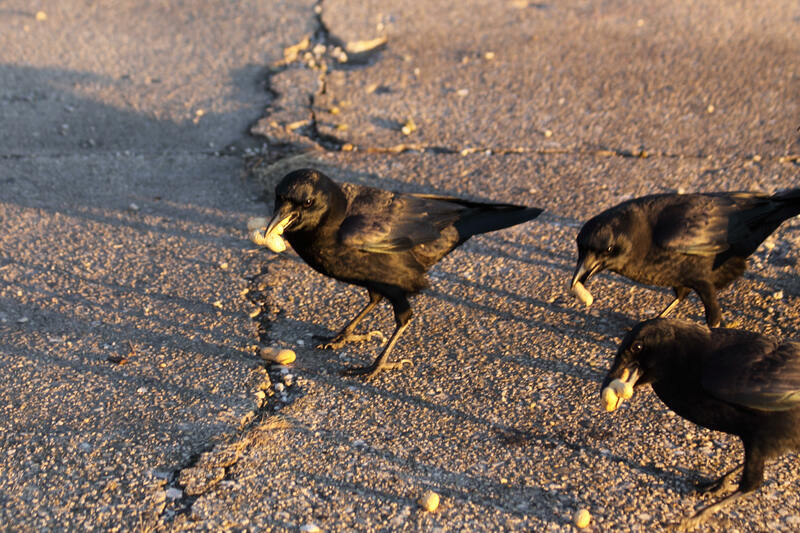 When I got up to the park this morning, the White-Winged Crow youngster was showing off her caching abilities.